Apart from the Tour Price, your Bhutan Visa for Single Entry costs USD 40 Per person just one time payment. Visa CAN NOT be applied nor issued from any where else, like from Bhutan Embassies in another country. The only way you can get a Tourist Visa is by booking your Travel with a Licensed Tour Operator. Applying for a Bhutan Travel or Tourist Visa is very easy. Bhutan’s Tourism Policy mandates that all travel to Bhutan has to be booked through a Licensed Tour and Travel Operator or Agents. So first contact a Licensed Tour Operator or Travel Agent based in Bhutan. Write to a Bhutan Agent, and after your travel to Bhutan is confirmed for the decided dates of travel, then a Visa Application Form needs to be filled in and the form is sent as mail attachment, along with your passport photo page copy. The agent submits this form and your tour itinerary to the Tourism Council of Bhutan and Department of immigration for approval. The next step is to wire transfer the entire tour money to the Bhutan Agent who then deposits the entire tour money into the Bhutan Government Account. After the money is received by the Government, your Bhutan Visa is APPROVED and then a copy of your visa is sent vial email attachment to you. 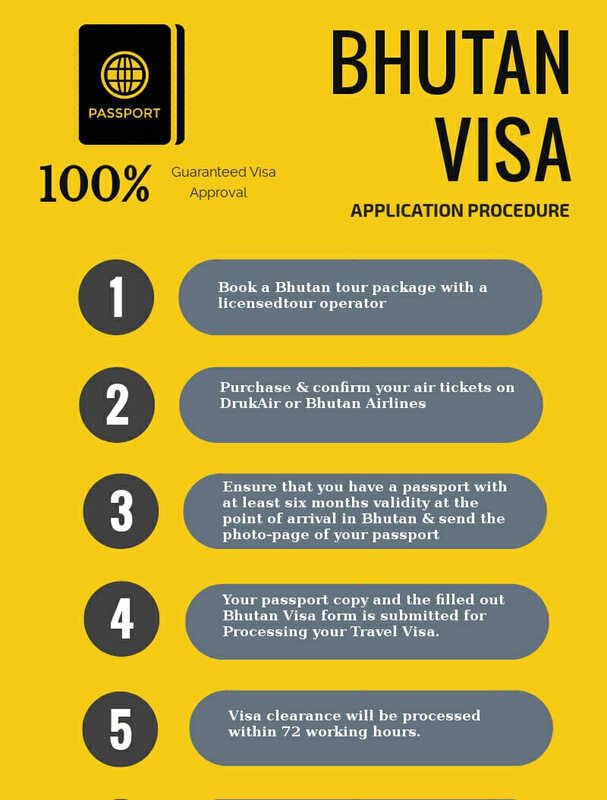 You print out this Bhutan Visa, and on your travel to Bhutan, you bring with you this visa along with your confirmed air tickets if your are flying into Bhutan, or produce this visa at the entry point if you come by road.